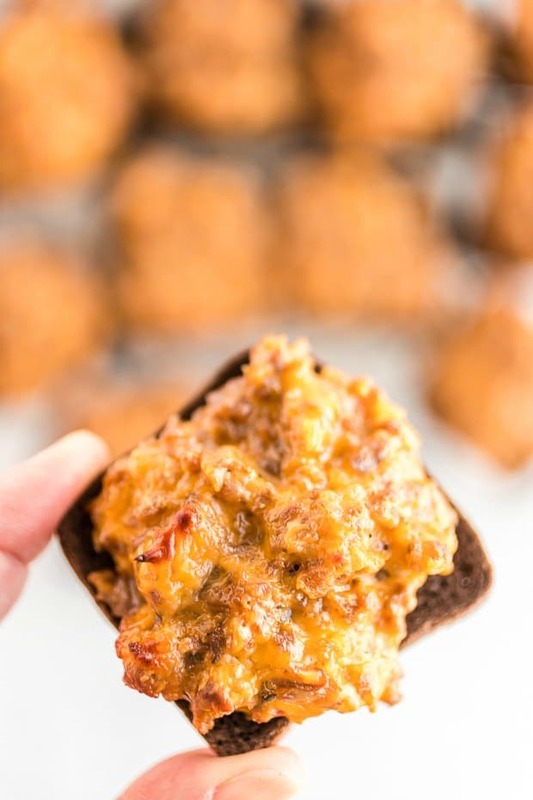 Hanky panky appetizers are another one of those good old fashioned recipes that my grandma hid under her belt and brought out at special occasions. Then, the first time I ever made this hanky panky recipe, it was such a big hit. 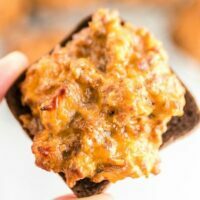 This combination of pork, beef and velveeta cheese on top of rye or pumpernickel bread has been one of my favorite appetizers to make and serve for a long time, even when I was first learning to cook. If you’re looking for more appetizer ideas, make sure you check out our little smokies, our amazing cream cheese dip or our buffalo appetizer meatballs. This hanky panky recipe is a quick and easy crowd pleasing appetizer. My grandma would always serve it at big family dinners. We’ve served these appetizers at baby showers, gender reveal parties, Christmas, Thanksgiving, New Year’s Eve and even Easter! Basically any time our family gets together. And there is never a morsel left. 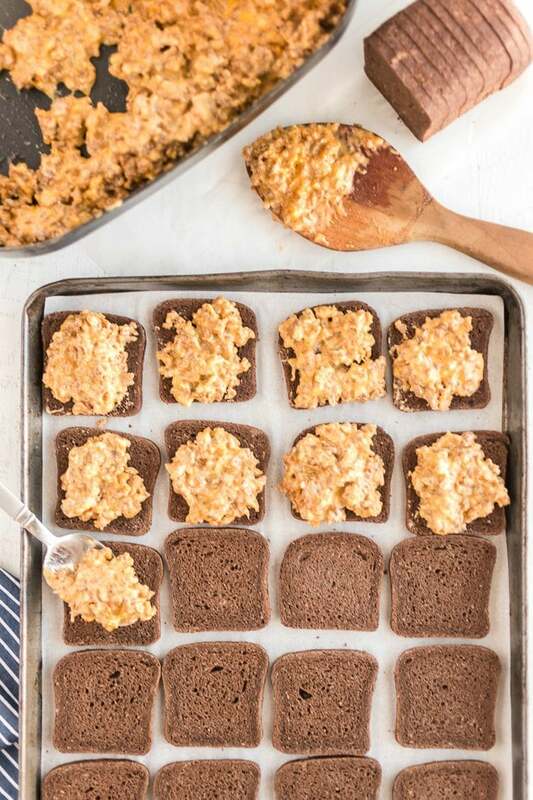 I suppose you could compare hanky panky recipe to an open face grilled cheese sandwich… But instead of being cheddar cheese on plain bread it’s hamburger meat, sausage meat and velveeta cheese on delicious rye or pumpernickel bread. …So it’s really nothing like grilled cheese because it’s so much better! To make hanky panky appetizers, first start by browning the hamburger and sausage meat with a little oil in a frying pan. Once the meat has browned, drain off the excess oil and meat juices and quickly wipe the frying pan clean with a paper towel. Put the hob on a low heat and return the hamburger and sausage meat to the pan. 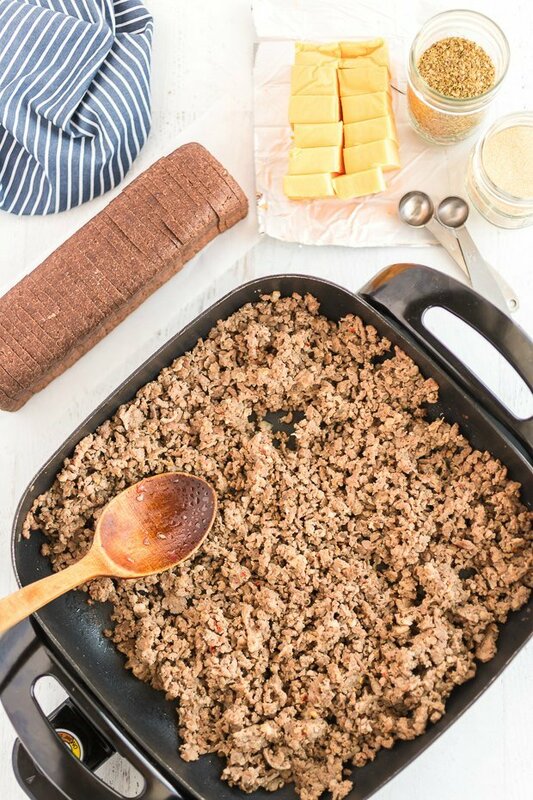 Add the velveeta cheese and ½ a teaspoon of garlic salt, 1 teaspoon of salt, 1 teaspoon of oregano and 1 teaspoon of worcestershire sauce to the pan with the meat and mix well on a low heat. Once the cheese has melted and the meat has been thoroughly mixed with all the other ingredients, spread your hanky panky on your choice of rye or pumpernickel bread. Hey-presto! There you have a delicious, quick and easy meal for the whole family to enjoy or a great cocktail food to serve at your next dinner party! The thing I love the most about this hanky panky recipe is that you can freeze the portions individually and then put them all in a plastic bag for storage in your freezer. When you’re ready to use your hanky panky recipe, simply place the mini individual portions in the oven at 425 degrees for 10 – 15 minutes to cook. Hanky pankies don’t take long to bake at all. That’s one of the reasons why I love to make them from scratch. I love to serve it on rye bread hot and fresh from the pan. Baking hanky pankies also isn’t always necessary. This recipe is perfect for putting in the slow cooker and leaving it to do its thing. There are so many ways that you could serve your mini individual portions. It makes for the perfect appetizer, hot snack or cocktail party crowd pleaser. Personally, I have found that the best way to serve hanky panky is with extra cheese on top to melt! Admittedly, I love all things cheese. Others enjoy hanky panky with worcestershire sauce or with oregano as extra garnishings aside from what’s already in the recipe. Sometimes, I like to make this hanky panky recipe with spicy Velveeta to add a bit more flavour! In my family, we have always serves hanky panky recipe on rye or pumpernickel bread, but there’s no reason why you can’t serve it on another bread of your choosing. 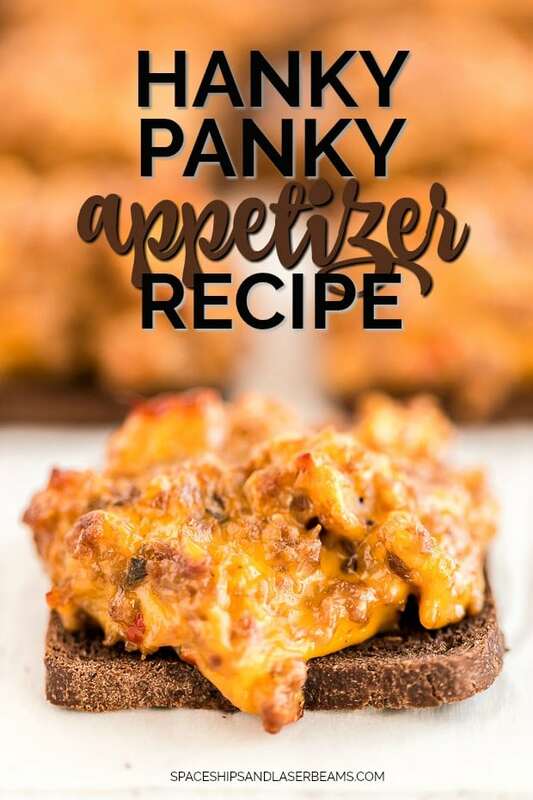 If you wanted to make this hanky panky recipe gluten free, simply serve it on gluten free bread, tortilla chips or a baked potato — and make sure that the sausage and worcestershire sauce are gluten free as well. What’s not to love about a dish that is easy to prepare and effortlessly serves a large crowd? Make individual appetizers on slices of rye bread or whip up a batch in the crockpot and serve it over tortilla chips. This zesty and delicious old fashioned appetizer will disappear in seconds it's so good! Brown the meat and drain well and return to pan. Add Velveeta cheese, 1/2 teaspoon garlic salt, 1 teaspoon oregano and one teaspoon Worcestershire sauce. Spread on individual-sized pumpernickel bread then bake at 425* for 5 minutes, until bread is toasted and topping is bubbling. You can also freeze individually by storing in a single layer in a freezer safe bag or container. Remove and bake for 10-15 minutes at 425*. This appetizer looks delicious and the perfect treat for the family.